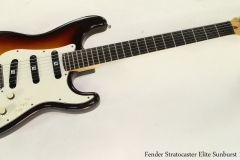 Here’s a rare bird – from 1983, a Fender Stratocaster Elite in sunburst. This model was built only in 1983 and 1984, and introduced a number of new features and hardware pieces. Most visible of these are the short-lived FreeFlyte knife-edge trem, and the pushbutton pickup selectors. New pickups were installed, and the output jack went on the side – in this case, a Neutrix locking jack. With the three pickup switches, all pickup combinations are available. Not so immediately apparent is the routing. From the top, this guitar looks very much like a Stratocaster. But if you turn it over, you see that there is no cover, or route, for the trem springs, just a small plate covering access to the output jack wiring. All of the other routing and assembly was done from the front, and this saved money in the production line. The neck uses a four-bolt plate and also has the micro-tilt screw adjustment, previously introduced on the three-bolt neck design. The Fender Stratocaster Elite from these two years is fairly rare. This example is in good playing condition, and the body is in very good condition, but the guitar isn’t entirely original. 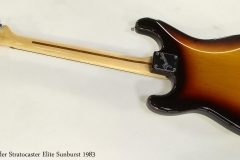 The original Elite pickups have been replaced with UltraSonic models, made in Germany. These pickups were designed by Bill Lawrence and advertised as being tonally neutral, and are typically adjusted to be close to the strings – their magnets are placed so as to not distort the string vibration. As well, the neck was originally a standard Fender maple neck. The owner had David Wren plane off the maple fingerboard section and replace it with ebony, then refret and refinish. Naturally, given who did the work, it’s very well done. Finally, the original tuners were replaced with Sperzel locking models. This guitar plays well and sounds good, with a definite 1980’s vibe. The original hard shell case is included.